A couple of weeks ago one of my coworkers brought in two little boy t-shirts for the little boy's mom that had been tie dyed with blue and green colors. The colors were beautiful and I thought how much I'd love to do the same to some plain white shirts for myself. I love indigo and decided to try that first. 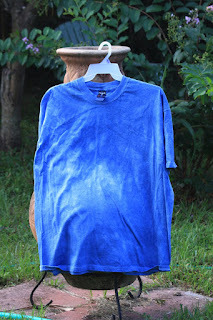 I ordered the basic indigo dye kit from Dharma Trading - they have EVERYTHING for natural and chemical dyes for all types of material AND they sell basic white shirts in all styles so you can dye them. Finally, this past weekend I got a chance to mix the dye in a big 5 gallon tub in the back yard. 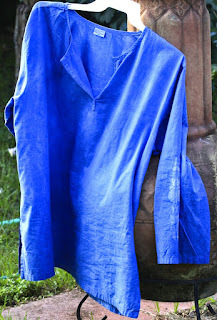 I had to mix in a very smelly chemical called a mordant, which causes the dye to adhere to the cloth. 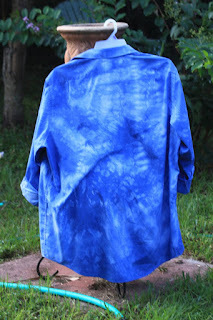 I followed the directions and managed NOT to get indigo dye all over me - I don't know how, since when I paint I always end up covered in paint. Anyway - I had two purchased and one free white shirt to dye. One was a peasant type blouse, the second was a 3/4 sleeve v-neck pull over shirt and the free shirt came with the order - just a basic t-shirt. Finally, on a whim, I grabbed a white work shirt of my husband's that was in the rag bag because of a stain on the pocket that wouldn't come out. It's a long sleeve button up dress work shirt. Here are my results. My favorite? The work shirt of my husband's that was destined for the rag bin!! Above is the peasant blouse. 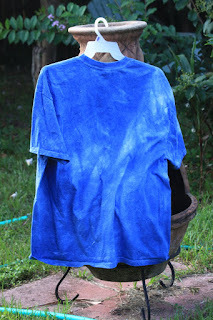 I just wanted it to be indigo blue - no design, so I dumped it in the dye bucket. 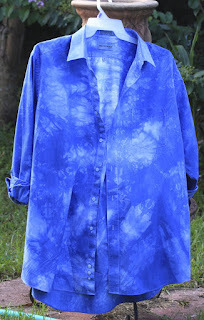 There is a slight pattern on the sleeve where the dye didn't penetrate all the way - but what the heck - it's home dyed!! 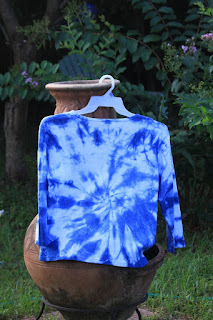 The color on the shirt isn't completely even anyway - even when you don't try to fold for tie dye designs - just dump it in - the color is darker in places. It is really lovely - and the blue is my all time favorite blue color. I realized this blue is the same blue of my Pea Vine flowers that I've posted pictures of on here recently (scroll down to the blue-purple flower) - no wonder that is my favorite flower! Above is my favorite - and it was a last minute throw in from the rag bag!! I LOVE this shirt. I folded it trying to follow directions, but I really didn't know what I was doing. I figured what the heck (as you can tell that is a motto of mine that I use regularly) - and it came out looking like a Hawaiian pattern - like big flowers. If you click on the picture, you can see the - dare I call it - design - better. This is a stretchy 3/4 sleeve V or scoop neck (I can't tell) shirt - I love the way this one came out, too. I tried the swirl tie - take a dowel, place it in the middle of the shirt (which is laid flat) and twist until the whole shirt has been gathered up. Then rubber band it in place. Not too bad for a first time dyer, doncha think? This one turned out even more "patterny" than the peasant blouse - I love it! 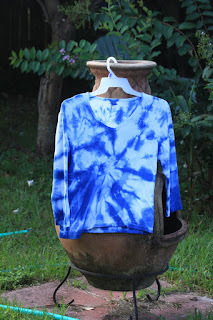 You just can't go wrong with tie dye - even if you don't tie! !